China’s LDPE market has been steadily moving higher since late April as per the pricing service of ChemOrbis. The market has been retaining its firm stance since players returned from the week-long National Day holiday in early October on supply concerns and record high local levels despite the continuous losses in the energy markets. Even though China remains firm, PE markets in other regions are on a downward trend. Indeed, the downward trend began in Turkey’s PE market in the second half of September. 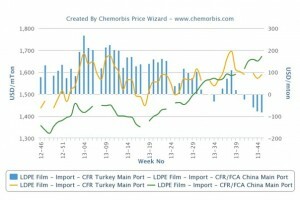 Retreating ethylene contract settlements and PE prices for October and November in Europe contributed to the losses of Turkey’s PE market, where demand remained restrained amidst shorter working days due to a holiday in October. The opposite directions the two countries have followed since then have caused the imbalance in the PE markets to grow gradually. 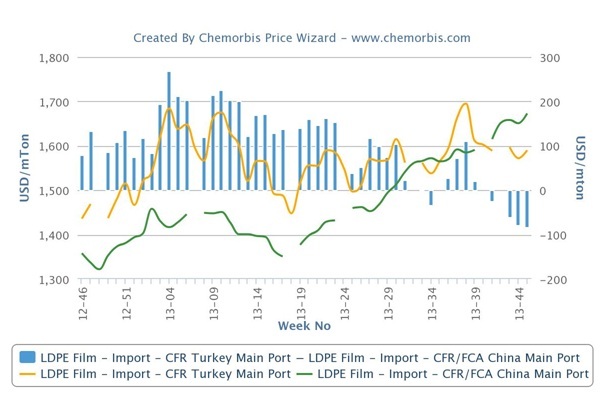 This is particularly visible in the LDPE market since Turkey is currently trading at an all time low level when compared to the netback to China. Under balanced market conditions, Turkey should carry some premium over China due to its smaller market share and freight difference as was the case in the first seven months of 2013. Nevertheless, Turkey has been trading below China since it lost this traditional premium in early October for the second time this year. Recently, this imbalance has grown enough to be characterized as an all time high, according to ChemOrbis Price Index. Due to the unfavorable netback to Turkey, many producers are shifting their allocations to China, comment players. “Only traders who hold regular allocations from their Iranian and Middle Eastern suppliers are able to offer these low levels to Turkey in limited tonnages. Otherwise, LDPE prices in Turkey need a serious correction,” said a trader. “Let alone the premium, current import LDPE offers to Turkey from the Middle East are $100-150/ton below the offer levels in China,” he added. According to ChemOrbis, buyers, on the other hand, do not want to rush for new purchases ahead of the year-end. “Retreating energy markets and poor demand do not match the firm picture drawn in China,” said a market player. Players are also wondering how long China can maintain its upward momentum. When supply concerns cool off in line with the arrival of import cargoes, the current firm sentiment may fade too, they argue.